I don't often do these things, but I have a nasty cold and am feeling generally hostile towards the world, so I hereby present my top ten London restaurant annoyances. Feel free to add any of your own in the comments section. 10. Being made to feel guilty for ordering tap water. 9. Italian restaurants and black pepper. Perhaps once, back in the mists of time, it was considered classy to have the waiter take 20 minutes grinding black pepper over every dish on a table of 15, but these days it's just irritating. Is there something more inherently precious about pepper that we aren't deemed worthy enough to use it ourselves on our own meals, and yet are given free reign with the salt? Leave the damn pepperpot on the table, Luigi, and leave me alone, thanks very much. The fact that I've never had a decent Italian meal in London is only part of the reason for my aversion. What I really object to is being charged £12 for a plate of bought-in pasta and tinned tomatoes which must have cost no more than 20p in ingredients. Steaks in Italian restaurants in London are always rubbish too. And no, I've not been to Locanda Locatelli or the River Cafe but I have seen their menus, and all I can say is if I'm paying £30 for a single plate of pork loin, I hope they have good enough binoculars to see me coming. Listen, it's a simple rule. The accepted service charge in this country is 12.5%. Anywhere charging 15% might as well just have "RIPOFF" written in leftover beetroot purée on the front step. I don't care if you perform the Heimlich manoeuvre on me after a piece of guinea fowl gets lodged in my gullet, or if you're trained in midwifery because the vindaloo occasionally induces labour. It's 12.5% and I'll only give you any more if I think you deserve it. The Wolseley is a perfectly good restaurant serving perfectly good food. The reason I will never go (at least not if I'm paying) is because they charge £2 for the privilege of walking through their front door and sitting down. I have no idea where this disgraceful practice started (perhaps they had a large number of diners scoffing free bread and tapwater then getting up and leaving, though I very much doubt it) but it has to stop now. There's been a rather worrying trend in London over the last few years to attempt to "posh up" what I will loosely call "Indian" dining, perhaps down to the mistaken belief that people in Mayfair won't eat tandoori chicken unless it comes served under a silver dome and with a winelist like a telephone directory. All of them - Benares, Tamarind, Amaya, the lot - are rubbish. I'm sorry to start sounding like their PR agent, but if Tayyabs can serve the best seekh kebabs in London at 80p a pop, there's no excuse for anyone else charging any more. How often have you ordered a dish billed as something like 'Chicken breast with truffle and cauliflower purée', only for said dish to arrive with a huge lump of chicken, a truckload of green salad and a miniscule pinprick of white sauce you can only assume is the purée because it's almost too small to see, let alone taste? This is even more common in mid-range restaurants who attempt to push the boat out with premium ingredients but can't make the numbers work without making one truffle go between 500 plates of food. I know that every good restaurateur needs to keep his or her eye on the bottom line, but some of the tables I've had to put up with just take the Michael. The places with the bench seating are the worst, Wagamamas seemingly of the opinion that the more you hear of your fellow diner's loft extension or cataract operation the better. But higher-end places aren't exempt from cynical seating either - here's another tip for restaurants: if the waiter has to move the entire table every time punters need a toilet break, you may want to rethink your seating plan. Whether it's expense account suits in The Square leaving plate after plate of the most exquisite food in London untouched, or braying hordes of Chelsea Sloanes barracking relentlessly polite Polish waiting staff in a Kings Road brasserie, there's nothing more potentially damaging to your faith in the human race than eating out in London. If you think that sounds overly misanthropic, next time you go out for a meal take a moment to observe the other diners in the room. I guarantee that the vast majority will be either loud, obnoxious, ignorant, disrespectful or a violent cocktail of all of the above. 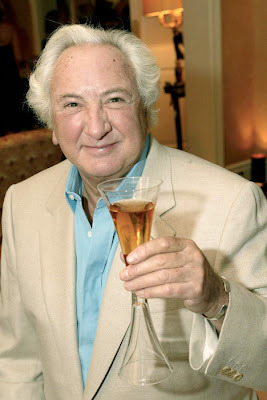 If I was Michael Winner I'd just book a private room whenever I went for dinner out, but then again, if I was Michael Winner, I'd be trapped in a room with exactly the kind of person I'd be paying to avoid. Ask many people to name their favourite meal, and the answer you receive will most likely influenced by memories of old holidays, old friends and many factors often far removed from the quality of the food and service at the time. 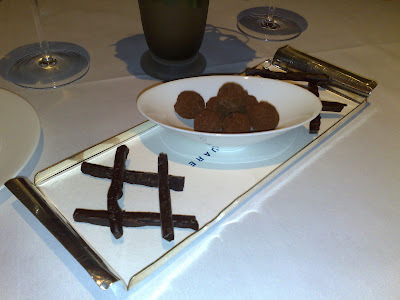 However, ask people to name their favourite restaurant, and you will probably be surprised how little the two overlap. A good meal can be a fluke, a moment in time that captures an emotion or relationship, a fortuitous confluence of good times and good company. A favourite restaurant has to be earned, and relies far more on rational concerns about quality of the cooking and competence of the service. Anywhere that produces a stunning meal one day and an apalling one the next will surely not last long, because the restaurant-going public are not gamblers. When spending a portion of their hard-earned cash, consistency is king. This is why the Fox and Hounds is a good restaurant; you can bring along friends and family time and time again and you are rarely if ever disappointed. And it is why the Builder's Arms is not. 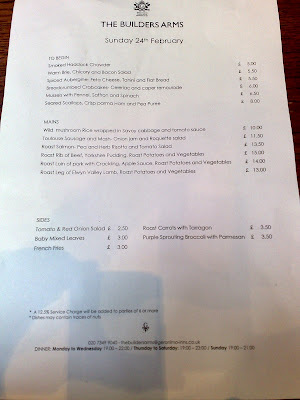 In October I had a very pleasant meal at a (then) brand-new tapas joint called Pinchito near Old Street. Perhaps it was the novelty of the new, or the zest of the chefs for their new joint, but the odd niggle wasn't enough to detract from the fact that this was a competent establishment turning out fresh and tasty food. Zoom forward a few months, and that lovely bowl of fluffy light calamari had metamorphosed into a horrible dark-brown greasy mess, and what was once a fresh and neat intepretation of tomato bread (tomato pulp served separately with a little spoon) was now unevenly cut baguette wiped with tomato and thrown onto a plate. Pinchito has gone downhill, and I can no longer recommend it with enthusiasm. 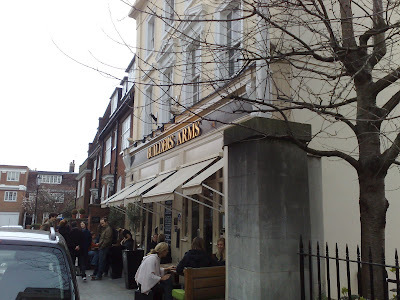 Based on my most recent visit, I'm sorry to say that it seems the same malaise has overcome the previously excellent Builder's Arms in Chelsea. 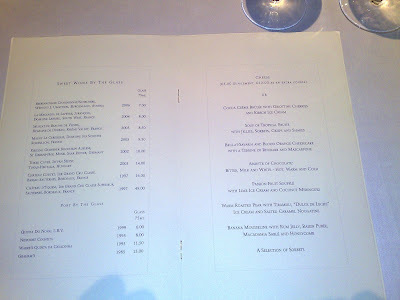 Last time, I had what I believe is the best Steak and Guinness pie it is possible to get hold of in London. In fact it was so good I made a special mention of it to the waiter, who didn't seem at all surprised and said that they got many people saying the same thing. This time, however, there was no pie on offer at all. Instead, the menu was geared towards traditional Sunday roasts and a few light seafoody bites for starters. We began with crabcakes and scallops, both of which were decent enough but failed to excite. 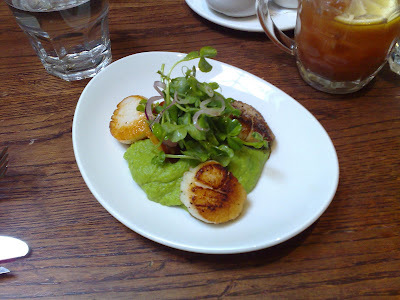 The scallops were well cooked and had a good crust, but didn't taste of a great deal and sat on top of a huge mound of pea purée which smothered a miniscule sliver of crispy ham. 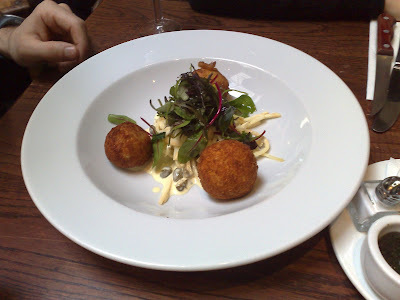 Crabcakes were underseasoned and uninteresting, just big balls of filler that hardly tasted of crab at all. 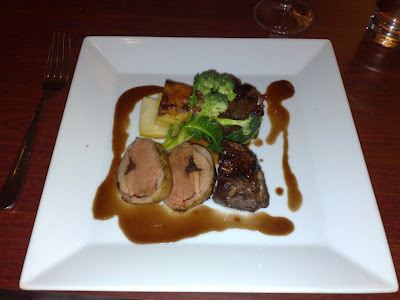 The best you can say about the main course was that it contained good quality lamb and was not overcooked, but the quality of the other ingredients ranged from mediocre to very bad. Potatoes were crispy to the point of teeth-breaking but fortunately there were only two very tiny pieces. Roast parsnip was actually burned to a crisp - yes that's it on the picture, peeking out from behind the flabby boiled carrots in all its charred glory. Cabbage was alright, but could not redeem the rest of the dish. In fact you can learn all you need to know from that picture - this was a sloppily presented, sloppily cooked plate of food. We didn't stay for desserts. It appears that what was once a solid, professional establishment has allowed itself to slip into mediocrity. But the whole experience just goes to underline my point - that running a consistently decent restaurant is not easy, and those places which do manage reliably good food without resorting to cutting corners are rare things indeed. I may visit the Builder's Arms again, and I may have a good meal, in fact I hope I will. But this does not make it a good restaurant. They're a long way off earning that. At the risk of repeating myself, if there's one thing Liverpool restaurants need to get sorted if they want to be taken seriously, it's service. 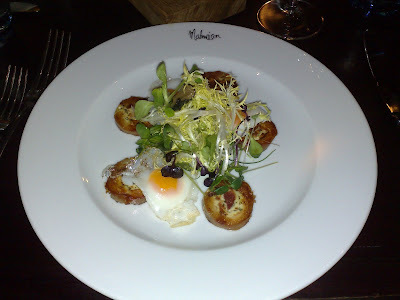 Our experience at the sharp end of the incompetence of Malmaison's staff began a few days before our meal when we called to book. We had specifically asked if the Local Produce menu was available on the night we had in mind, and were reassured it was. However, on sitting down in the pleasant 'New York-y' (ie. 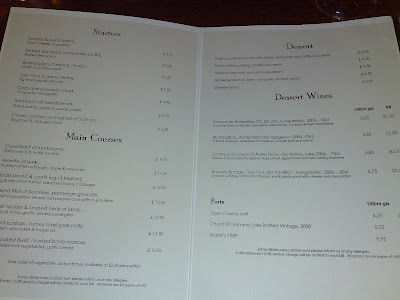 very dark) dining room on Saturday evening we were presented not with a local produce menu but a 'Valentine's Special'. The waiter seemed unconcerned; they didn't have the local produce menu but we could choose from the normal menu or the incredibly unexciting Valentine's Ripoff option. Then he disappeared for half an hour. I can't be too harsh on the Mal, perhaps. It is a new restaurant with what I'm sure is a very strong management team behind it having to put up with less than experienced new serving staff. In sharp contrast to his colleagues, the sommelier was the picture of professionalism and knowledge and throughout the evening appeared to be getting as frustrated with the failings of the rest of the staff as we were. 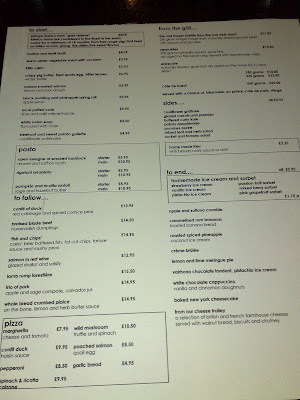 And the food, when it finally arrived, was actually rather good, one almost unforgivable error aside. My starter was 'Crispy pig trotter, fried quail's egg, bitter leaves and winter truffle'. For £6.95. Winter truffle at £6.95? Alarm bells were ringing but I thought I'd give them the benefit of the doubt, and asked the waitress if that really was fresh black truffle for such a bargain basement price. Apparently it was. I ordered and allowed my eyebrows to lower. When the dish arrived, it had none of the scent of truffle at all, so I immediately thought that this was how they were able to make the figures work - they just used such a miniscule amount you could never notice it. And then as I bit into some of the bitter leaves, the mystery was revealed in the form of a horrible solid lump of preserved black truffle, with all the flavour of cardboard and the texture of solidified snot. The inclusion of this offensive item was a disaster, of course, but what frustrated me was that it could so easily have been avoided. Malmaison Brasserie, you have two options: either leave out the ingredient altogether, in which case it's a perfectly nice starter anyway, or include proper truffle and bump up the price a bit. Even truffle oil would have worked, I just don't understand who ever thought dropping in a lump of Tesco's preserved truffle would be a good idea. 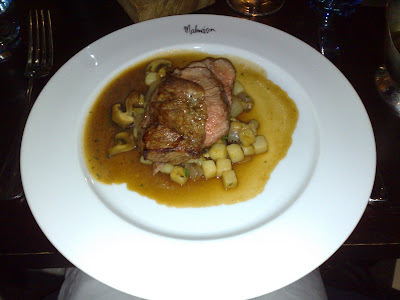 I am pleased to say that my main course was almost good enough to make me forget about nasty little bits of hard old fungus - superbly cooked lamb rump served with mushrooms and diced potatoes. Not the most haute cuisine of dishes and the presentation left a lot to be desired, but really who cares when it tastes nice? I don't. But it appears I just struck lucky with this dish as the standard around our table varied hugely. Steak was good, burger not so good ("Better than the one next door", the menu said, and it was right - the Crowne Plaza serves the worst food this side of Helsinki - but this is hardly something to boast about), and confit of duck flabby and uninteresting. 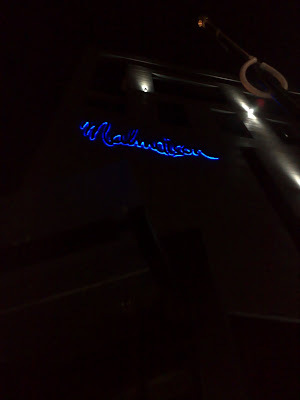 Still, the prices weren't astronomical and the building impressive from inside and out, so in many ways the Malmaison is a worthwhile place to spend an evening if you're willing to play the Menu Lottery. So that's Malmaison and London Carriage Works ticked off the 'places to try' list in Liverpool, with Ziba and 60 Hope Street to go. Perhaps the best is yet to come; never let it be said I am not an incurable optimist as well as a masochist. Wish me luck. 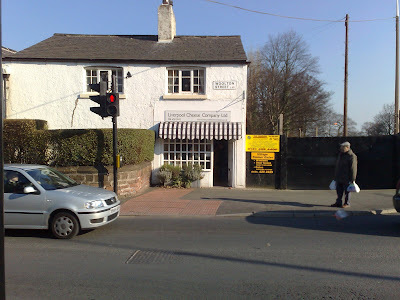 The existence of the Liverpool Cheese Company, in a cute end-terrace cottage in Woolton Village, is proof that the nicest things can turn up in the unlikeliest of places. Most people - even most Liverpudlians - would have to make a special effort to find this shop, tucked away on the outskirts of the village and hardly conspicuously advertised, and yet those who did would be rewarded with a range of cheeses and depth of knowledge from the staff to rival anywhere in London. 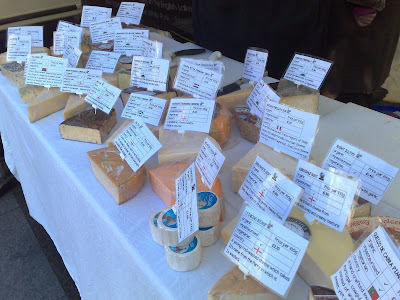 The stocked cheeses were from all over the world, albeit with a healthy - and proper - bias towards the North West of England. Mrs. Kirkham's was there, of course, so we snapped up a block of that, and something called Barkham Blue which tasted nice enough in the shop but didn't really improve in turning room temperature later on so I won't dwell on it. What did impress was Baltic, a soft cheese made in the North-East but crucially with its rind washed in Summer Ale from the Baltic Fleet microbrewery and pub just a few minutes walk from the Albert Dock in Liverpool. I was told that the two parties responsible for Doddington Dairy and the Liverpool brewery respectively met while at university together, and that after going their separate ways decided to collaborate on a joint food project some years later. It's a lovely story, and shows that where other cheeses have hundreds of years of history on their side, new cheeses have to fight their corner with expertise and a genuine love of the product. As with Stinking Bishop, the rind washing is a very subtle process and you should probably not expect an overwhelmingly explicit taste of beer (or indeed perry) on tasting; instead, the alcohol on the rind adds just a slight tang to complement the salty flesh inside. 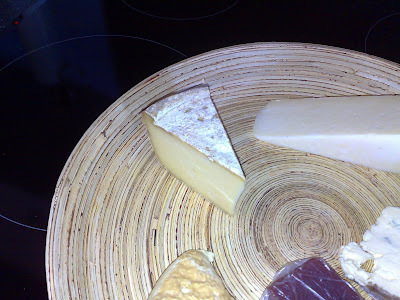 However, it's texture that is Baltic's strongest point - a spongey enough flesh to be satisfying to bite into but firm enough to contrast well with the slightly harder rind. It is a harder cheese than Stinking Bishop but has the same pattern of tiny bubbles and would certainly match up well next to many continental cheeses of the same style. On Sunday afternoon I bumped into Ian and Vicky of the LCC again as they manned their stall at the Hope Street Farmers' Market, and gave them my feedback on our purchases from the previous day. Embarassingly, Barkham Blue turns out to be Ian's favourite, but admittedly I was in the minority in those tasting the cheese on Saturday evening too. It also went very well in salad. But it's the Baltic that I will really remember, a fine cheese with special provenance and a very deserving Cheese of the Month. So just as I was changing into my nice shoes towards the end of a day in the office, I got a call from a rather harassed sounding woman from the restaurant to say that there'd been a power cut in Mayfair and she'd have to cancel our table! A couple of frantic phonecalls later I managed to find a table at The Square, that other Michelin-starred Mayfair stalwart, and fortunately our evening was saved. On the way to the new venue from Oxford Circus tube I peered into the darkened reception of Hibiscus to find a few miserable looking couples sitting with their bags and coats while the a receptionist tried presumably to find them other suitable accommodation. So I suppose it could have been a lot worse. Just ask the man caught in that explosion. 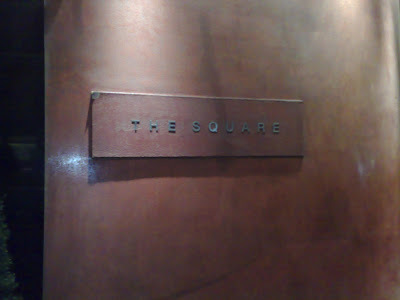 The Square has always held a very special place in my heart - anyone who knows me could tell you that one of the best things I've ever eaten was their signature crab lasagne - yet it had been a good four years since I'd paid a visit. Claude Bosi, who runs Hibiscus with his wife Claire, is very much a "chef's chef", always in the restaurant during service (unlike certain other sweary craggy-faced megalomaniacs I can think of) and devoted to his craft, and Philip Howard of The Square is very much in the same vein, so it seemed a logical swap. Very little seemed to have changed in the restaurant; the staff were still as friendly and professional as they were numerous, the spacious if functional room buzzed with the great and good of Mayfair high society (Philip Green was there last night) and the food... words cannot describe. But I'll do my best. Amuse-bouches were presented on a bizarre wooden contraption into which were inserted items such as anchovy bread, cauliflower mousse (in a dainty little pastry cup), a folded slice of what looked like beetroot but I think was some other root vegetable, and a couple of other items which I couldn't even begin to describe but tasted, without exception, very nice. Our bouches were very definitely amused. 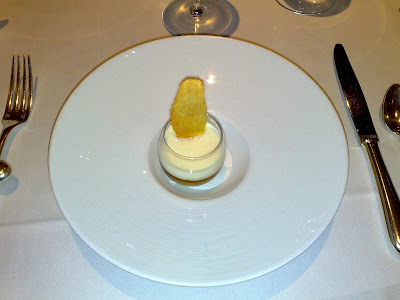 Next a pre-starter of cauliflower mousse on some sort of vegetable jelly was, again, brilliant. This restaurant does things with cauliflower that boggle the mind - it was a similar amuse of cauliflower mousse that formed one of the highlights of my first visit all those years ago, and this brought the memories flooding back. 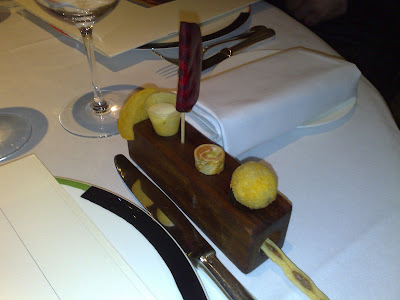 My starter proper was the "Velouté of field mushrooms with a soft poached egg and a truffled brioche roulade". 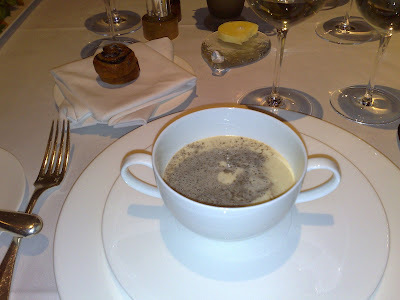 Like my favourite courses at Foliage, this was superficially a straightforward mushroom soup, but rich and fluffy and served with fresh truffles shaved on top by the waiter thus transforming it into something truly memorable. I think you could have served my bowl again without washing, I scraped it so clean. Delicious. Oh, and in case you're wondering why I didn't have the crab, I thought I'd leave that particular memory without danger of being tarnished, although two other diners on our table did have it and from what I can gather it was as good as ever. But better was yet to come. "Roast calves sweetbreads with feuillantine of onions and tongue and a sauté of kidneys and mustard" was so good I never wanted it to end. The feuillantine were dainty onion chips sandwiched between the most phenomenal cabbage and truffle mixture which was so astonishing I had to pass it around the table to share my joy. 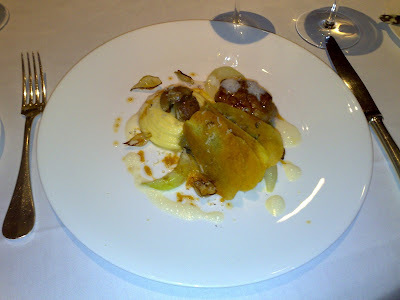 The generous serving of sweetbread was as good as any I've tried, perfectly cooked, soft and succulent, and the two little kidneys were firm and tasty pieces of meat perched on top of a rich purée. So much going on it seems reading this description that the flavours may have become slightly confused, but it all worked together perfectly. 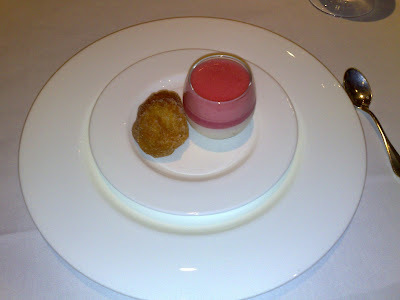 The pre-dessert was a glass of heaven's own rhubarb and cream concoction served with a fluffy nugget of doughnut. It was also fantastic. 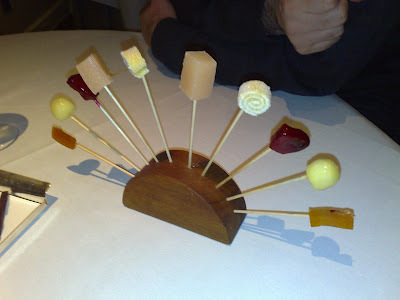 By this point everyone was so bowled over by the standard of dishes that anything less than the greatest dessert of our lives would have been a comedown, and I'm afraid the general consensus was that the desserts were the weakest of the courses at The Square. 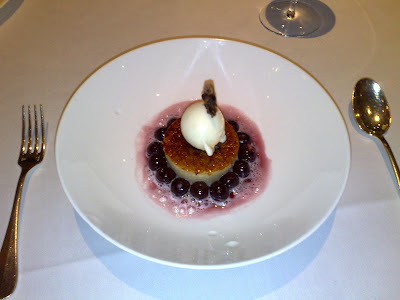 Some were better than others - a soufflé was particularly good - but my "cocoa crème brûlée with griottine cherries and kirsch ice cream" suffered from hugely overpowering (and dangerously alcoholic) cherries which meant the crème brûlée was slightly lost. Good alright, but not perfect, and the other dishes had been pretty damn close to perfect. There were yet two more courses to round off the evening. Innocuous-looking chocolate truffles burst in the mouth to reveal a wonderful fruity liquid center, and were served with matchsticks shot through with fruit jelly. Finally, a spectacular spray of teeny homemade sweets were generally also excellent apart from a couple of pieces of grapefruit rind which were so bitter I can still taste them 12 hours later. But they were nothing if not a talking point. This meal came only a couple of weeks too late to be my favourite of the last 12 months, but believe me it's very much in the running to be top of the list for 2008. I've used so many superlatives in this writeup I've exhausted the list in my thesaurus, so all I can suggest is you book yourselves in and see how good it is for yourself. 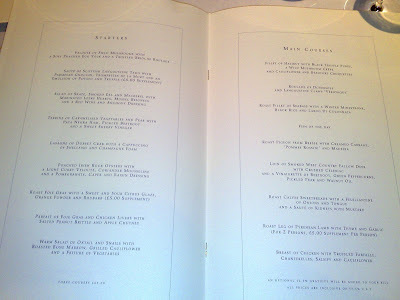 It's not the cheapest of places - we paid £86 a head and didn't have a huge amount of wine - but for your money you get faultless service, a luxurious situation and eight courses of pretty much the best food you're likely to eat in London. Philip Howard at The Square, I salute you. It's not that I don't like change per se, I just don't like change for the worse. 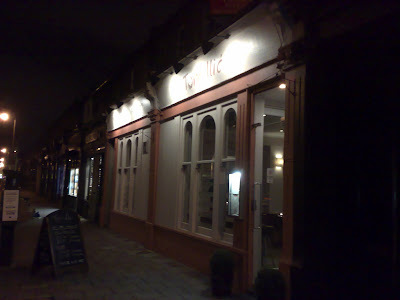 And as the Food Room was a lovely little restaurant, I was suitably distraught when it closed, then firmly suspicious when it reopened a few days later under a new owner. Identical from the inside and out, with a very similar menu, same waiting staff, same Toptable offer (£23.50 for 3 courses and a glass of sweet Prosecco) and same odd predilection for having several industrial strength heaters blasting away despite the already roasting temperatures, it seemed at first that all had changed was the name above the door. And on our arrival at 7:30pm, we were the only diners in the restaurant, another thoughtful tribute to the old place. So my nerves were well and truly settled by the time the lovely house bread arrived; phew, I thought, it's business as usual in Battersea, my favourite local restaurant never went away, it's just had a facelift. I fully admit I am in the minority in singing the praises of the old Food Room. Many people, amongst them pretty clued-up professional critics and bloggers, didn't think much of the place. I have no idea why - perhaps they just begrudged having to travel across London to this dark and lonely spot on the Queenstown Road and lost their appetite. All I know is, they were wrong. The Food Room was great, and should have carried on for ever, empty night after night unless I decided to grace them with my custom. Sadly, it wasn't to be. Damn you, market forces. So there I was, encouraged by the familiar surroundings and moreish slices of warm parmesan bread, and generally feeling pretty positive. And then the food arrived - not *bad*, exactly, just not particularly interesting, flavourful or memorable. 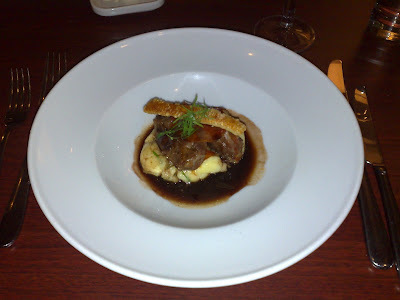 My starter was Braised pig's cheeks & chorizo, and was well presented and well proportioned in terms of the "veg to meat" ratio. But the potato was bland, the pig itself was underseasoned and even the crispy stick of skin resting on top - usually my favourite part - was underwhelming. I would otherwise have been willing to dismiss this as a rare misfire, except I was under the impression that pig dishes are what Tom Ilic is best at, and so I wasn't prepared to overlook this boring plate of food, plus a companion's Fois Gras terrine was similarly bland and heavy-going. Sweetbreads were OK though. 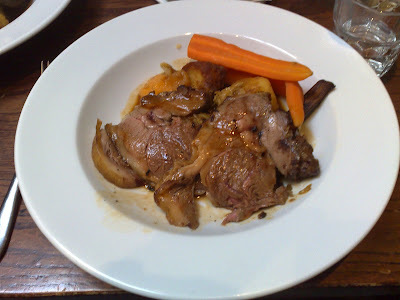 Roast saddle and braised neck of lamb was interesting to look at, generous in terms of the servings of meat, and the little medallions of saddle were moist and tasty. But the braised piece was unpleasantly dry and chewy, and along with the potato and "spiced" aubergine (just mildly pickled as far as I could tell), underseasoned. 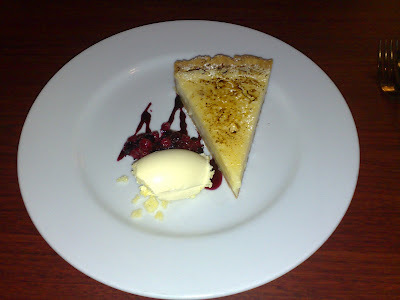 In sharp contrast to the dip in quality of the food over the course of the evening, by the time we were ready to order dessert (lemon tart - nice enough, though not a great deal better than any shop-bought specimen), the restaurant was packed. On the table next to us was Giles Coren, whom the chef made a very public point of coming out to embrace like an old friend. Maybe they are old friends, I don't know, but I wonder how objective the review in the Sunday Times will be, knowing that the kitchen and service are alerted to the presence of a national food critic. OK, that sounds unforgivably bitter - I admit it, I was seething with jealousy and I want Giles Coren's job. He seemed like a lovely person, I enjoy reading his articles and I suppose it's only natural you make friends if you move in the same circles. I just wish he'd been there a few months ago when the Food Room was doing things much better and nobody gave a monkeys. I wonder how long Tom Ilic can keep a full restaurant on a Tuesday night, once the critics have written their reviews, the novelty factor wears off, and people start to realise that there really isn't anything that special about a place that for most Londoners takes quite an effort to get to. And maybe I'm being unfair - I suppose the worst you can say about Tom Ilic is that it's dull, and really there are worst things to be - expensive and dull, for example. 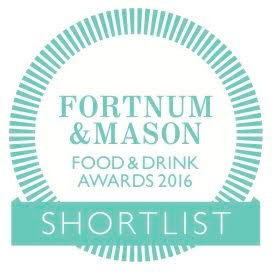 But until those lovely memories fade, I'll be wearing my black armband for the Food Room. Why can't the good things last forever?